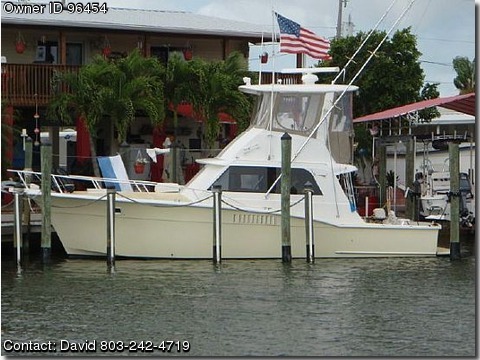 Please contact the owner directly @ 803-242-4719 or jdstenberg(at)live(dot)com.This 36' Hatteras is an excellent salt water fishing vessel. She has extensive experience catching King Mackerel, Dolphin, Wahoo, Grouper, Blackfin Tuna, and much more If you're looking for a great family weekend cruiserdivefishing boat, then this boat is for YOU. Reel Wise would also make an excellent charter boat if you're in the market for one. We are still using the boat and looking to downsize. Boat Name Reel Wise Engines Engine 1 Engine Brand Caterpillar Year Built 2004 Remanufactured Engine Model 3208 Engine Type Inboard EngineFuel Type Diesel Drive Type Direct Drive Engine Hours appx 900 Engine 2 Engine Brand Caterpillar Year Built 2004 Remanufactured Engine Model 3208 Engine Type Inboard EngineFuel Type Diesel Drive Type Direct Drive Engine Hours appx 900 Generator 4KW Westerbeke Diesel New 2008 Tanks Fresh Water 70 gal 2 Fuel Tanks 300 gal Hot Water Tank 6 gal Electronics 2 Furuno 3D NavNet New 2012 Raymarine Autopilot Azimuth Compass VHF Radio Clarion AMFMSirius Sirius docking station Anchor Windlass Remote for Spotlight JBL AMFMCD Deck Stainless Steel Hardware Anchor, Chain, and Line Spotlight Horn FreshSaltwater Wash-down Emergency Life Raft BridgeHelm 2 Captain's chairs Captain Foot Rest 94 qt Igloo Cooler Storage Clarion Speakers Sirius Docking Station Fully enclosed with Eisenglass Fishing 7 Gunnel Rod Holders 5 Rocket Launcher Rod Holders 2 Rupp Double Outriggers Accommodations Salon has lots of room with galley up, port side. Three steps down to headshower port and two bunks starboard with storage. V-Berth is located all the way forward and features storage, lighting, and portholes.